Global Solar PV Backsheet Market size for 2016 was valued over USD 2 billion and the annual installation is set surpass 7 billion square foot by 2024. Solar PV backsheet market size will gain comprehensive upsurge on account of ongoing proliferation across the solar industry coupled with conducive regulatory framework to further stimulate the adoption of photovoltaic units. In addition to the national renewable integration targets in line with the Paris agreement, growing consent with respect to environmental security have comprehensively escalated solar system deployments. Furthermore, increasing government aided schemes, programs and incentives including tax rebates and solar investment tax programs have instituted a favourable business scenario. The solar PV backsheet market share in the recent years has witnessed a significant escalation in line with rapid deployment of roof-top units across commercial and residential establishments. Roof-top deployments over the years subject to fiscal benefits across nations including FiT, net metering, subsidies, leveraging & funding schemes have witnessed substantial escalation. Furthermore, ongoing expansion of micro-grid networks to cater the rising off-grid energy demand will augment the adoption of photovoltaic technology which in turn will foster the industry growth. In 2016, Asian Development Bank under its Solar Rooftop Investment Program announced an investment worth USD 505 million toward deployment of solar PV systems in India. 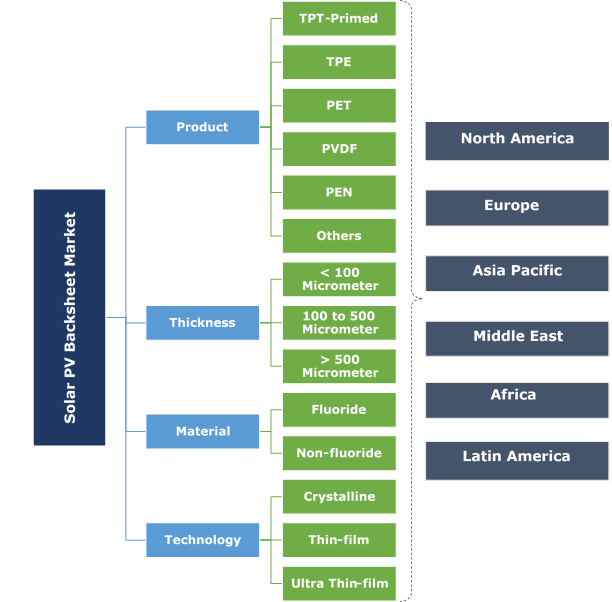 TPT solar PV backsheet market have gained a modest share subject to their high inherent strength and effective weather resistance when compared to its competitive counterparts. The product features a low permeability of vapor oil or moisture and can further withstand temperatures ranging across -70 degrees Celsius to around 110 degrees Celsius. Henceforth, effective technical specifications coupled with expanding industrial framework will positively influence the product landscape. TPE in 2016, accounted for over 12% solar PV backsheet market share. In the current industrial scenario, the technology act as an economical substitute to TPT configurations. These products have witnessed an appreciable penetration subject to the availability of cost-effective and efficient auxiliary backsheet technologies. Rapid technological enhancements related to operational flexibility and efficiency are anticipated to drive the product demand. PVDF composite has witnessed a significant penetration over the years owing to its economic cost structure and a comparatively sustainable product efficiency. However, rapid development of enhanced composite compositions coupled with the availability of effective auxiliary insulating layers has started to hinder the product expansion. Technological developments coupled with ongoing R&D to enhance the productivity of the existing product will sustain the solar PV backsheet market. < 100 micrometer backsheets is predicted to witness strong growth owing to lower product costs and extensive deployment across small-scale solar applications. Enhancing unit efficiencies and rising inclination toward operational flexibilities will stimulate the product penetration. Furthermore, the rising demand for cost-effective and cost-efficient solar modules across rooftop installations coupled with rising off-grid deployments will boost the solar PV backsheet market landscape. Utility based deployments along with ongoing adoption of photovoltaic technology to establish a sustainable energy mix across industries will augment the > 500 Micrometer solar PV backsheet market. Expansion of public- and private-owned solar farms along with the increasing demand for photovoltaics across regions with low irradiance will further nourish the product demand. Fluoropolymers account for over 50% of global solar PV backsheet market, subject to their early adoption and unit longevity. These products possess higher efficiency and insulation properties when compared to its non-fluoro counterparts. However, the integration of fluorine for production in the recent years has inclined consumer perception towards the adoption of cleaner auxiliary backsheet technologies. Non-fluoropolymers subject to comparatively lower efficiencies and shorter life cycle when compared to fluoropolymer backsheets have gained modest share across the solar PV backsheet market. However, in the recent years, ongoing issues related to the disposal of fluoropolymers and the availability of cost-competitive auxiliary non-fluoropolymer technologies have escalated the industry growth. Crystalline solar PV backsheet market is set to witness a growth of over 4% by 2024. The heavier composition of crystalline cells along with large-scale deployment of these units escalate the demand for support and insulation materials. Increasing product efficiencies coupled with the development of compact panel structures will drive the deployment of advanced backsheet technologies across crystalline photovoltaic modules. 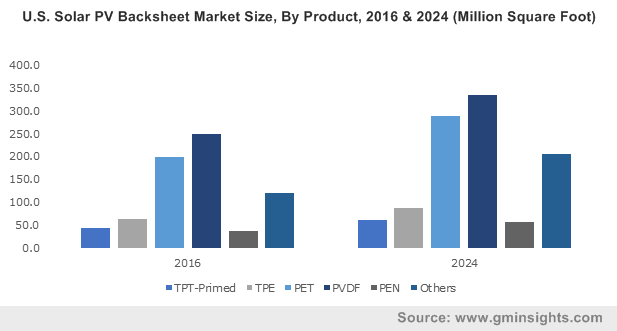 Diversifying compositions coupled with ongoing R&D to develop effective and operationally flexible products will positively influence the global thin film solar PV backsheet market size. Furthermore, proliferating EVA film technologies along with rising investments to achieve sustainable unit specifications will further escalate the product demand. The U.S. solar PV backsheet market in 2016, was valued over USD 300 million. The industry is rapidly maturing across the region and solar electricity has been economically competitive when compared to other available energy sources. Moreover, the industry has been a ratified incubator for job growth throughout the region. As per the U.S. Department of Energy in 2016, solar jobs across the nation have escalated by 123% since November 2010, accounting for about 209,000 workers. Europe has led PV development for a long time in the past, representing an appreciable share of the global cumulative photovoltaic market. However, stringent norms pertaining to capping of Feed-in Tariffs and investment grants have hindered solar installations across the European nations. Thereby, although the industry has witnessed a slight let-up in the recent years, but ongoing regulatory reforms adhered by national renewable integration targets will positively influence the solar PV backsheet market growth. China solar PV backsheet market is set to exceed an annual installation of over 2 billion square foot by 2024. The nation has been the world’s largest investor in clean energy and is on pace to install sustainable amount of new solar in the coming years. The National Energy Administration in 2017 reported an 80% increase in the electricity output from PV plants across the nation. High-end investments toward renewable integration coupled with growing concerns pertaining to emissions from conventional generating plants have further instituted a favourable industrial scenario. Provision of cost effective backsheet units with consequent expansion of manufacturing base to cater the rising demand has been the prime strategic implication across the solar PV backsheet industry landscape. Rigorous technological R&D coupled with a steep decline in the overall levelized cost of photovoltaic installations and have further propelled product deployment. The PV backsheet is the outmost layer of the module and is designed to shield the components from outside stresses. The industry on account of advancements in technologies coupled with the declining component cost has witnessed immense competition. Large market players including DuPont, Isovoltaic, Coveme, and Arkema surface the industry landscape subject to bulk manufacturing practices coupled with product-focused R&D.